Principal Function: To serve the church by creating and initiating wholesome, spiritual, and creative programs for Victorious Believer’s Ministries (“VBM’s") Children’s Ministry (grades 9-12) and Young Adult Ministries (College Campus Outreach up through ages 30) that will encourage and promote good habits, strong minds and bodies, and facilitate a desire to live godly, productive lives. • Must be a good role model/mentor with no criminal record of child abuse and must lead by example in faithfulness, attendance, and stewardship. May require criminal background check. • 3-5 years of leadership experience in youth and/or young adult ministry. 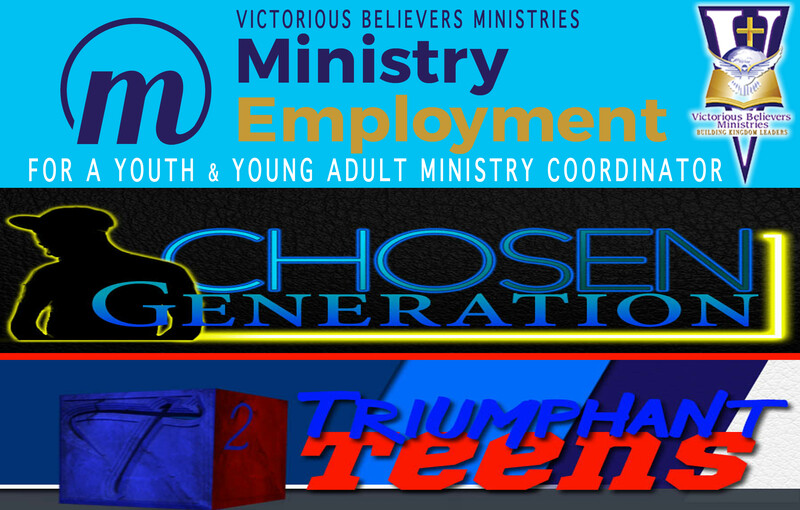 • Plan, administer, coordinate, supervise and evaluate a comprehensive, active and vibrant teen ministry for high school youth and young adults. • Make recommendations for a curriculum for Bible study for youth and young adult ministries. Provide for the church’s midweek (Wednesday night or alternate) programming. This time is spent in spiritual growth activities such as singing, sharing/rap sessions, creative games and activities. It includes a devotional topic/message(s) or Bible study from the ministry coordinator (and/or youth workers). Where necessary, recruit team leaders and teachers to assist (criminal background check may be required). • Plan and provide activities and outings for teens and young adults to meet their social needs. • Coordinate fund-raising activities to generate funding for youth programming (i.e. weekly offering, fundraising activities, etc.). Incorporate specific funding/projects within the annual budget. Submit annual budget to the Board of Directors. • Assist in the co-coordination of the annual Back-to-School Rally in August. • Cooperate with the Pastor, Board of Directors and leaders in promoting the entire ministry plan of VBM. • Utilize the services of the secretarial, facilities staff or volunteer, which are consistent with their position descriptions. • Serve as an effective staff liaison to assigned Ministry Teams and/or Standing. • Adhere to church approved guidelines as set forth in the VBM Bylaws and Employee Handbook. • Maintain a vital and growing personal walk with the Lord through committed bible study, prayer and meditation. • Faithfully attend services and teaching ministries. • Financially support the work of VBM by faithfully tithing (10% of your income). Maintain wise stewardship measures over the remaining 90%. Teach the Youth/Young Adult Ministry department the importance of tithing and giving. • Promote and support the overall vision of the Pastor to all Youth/Young Adult Ministry participants. • Attend at least one prayer meeting monthly (i.e. Monday evenings, Monday-Friday Noon). • Teach children biblical mandates and engage in conduct that is in agreement with Pentecostal beliefs. Performance of this job will be evaluated by the Pastor and Senior Director of Ministries in accordance with the provisions of the Employment Policies established by Victorious Believers Ministries.